Several series of ALCo-design diesels were delivered from Schenectady or Montreal. 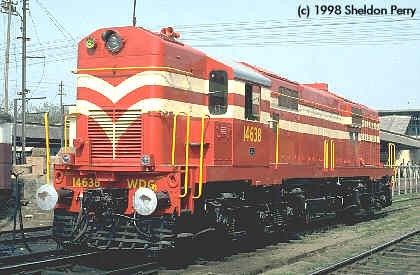 After the establishment of the Diesel Locomotive Works (DLW) at Varanasi in 1961, domestic production of class WDM2 hood units began in 1964 and still continues! All 100 DL500C's were built by ALCo in 1957/58. Dave Kornfeld reports: DLW has had a 251 update program ongoing, featuring "fuel efficiency" kits developed at their Lucknow Research Centre. Additionally, there has been an ongoing program of replacing the old ALCo turbos with modern GEC-Napier turbochargers. This program has also been deemed a success, as fuel efficiency has increased, along with an increase in traction horsepower. Unfortunately, the heavy black smoke emission during transient (acceleration) conditions has been abated to a very obvious degree.